I could spend all day exploring the great things to do with maps in the classroom. Between Google Earth and My Maps, there are so many ways to explore the earth and connect it to content in the classroom. As I prepare to teach a class on this for staff, I got lost in the many games that are now available for kids to just have fun with maps. What is really great is that they work on a Chromebook making it something that kids can do on their own devices. SmartyPins is a marriage of trivia and maps that is wrapped up in a fun game for kids. You begin by selecting a category (arts and culture, science and geography, sports and games, entertainment or history and current events). You are given 1,000 miles certain number of miles of which you can lose for inaccurate answers or gain for fast answers. Areas currently covered are the U.S., U.K., Australia and Canda. Another equally fun but more interactive map exploring game for kids is called Geoguesser. This web-based game can be played in single player or challenge mode. You are dropped in a street view map and you have to guess where you are. You can move around the location, spin the view to explore and use clues to explore. You gain points while trying to guess 5 different locations. Additional games for various continents and topics are also available. Learn about the location while experiencing real street views! So much fun! A while back I learned about Slides Carnival as a resources for some great presentation templates to dress up Google Slides. I used many of them and was pleased with how easy they were to copy and use. Slides Carnival not only provides you with great templates but each template has some awesome presentation tips and guidelines for creating better presentations. The second slide of the presentation generally give instructions for use as well as the attribution requirements for the graphics within the slide making it easy, clear and fun to build off of some great ideas. This week I revisited Slides Carnival to see if there were new templates I might use and was pleasantly surprised to find that they have added several new ones. And they are FREE! Specifically the Halloween 2015 Slide Carnival Template Deck would make for a fun Halloween themed lesson full of pumpkins, cats, spooky font and more. Check it out by clicking here. From the last time I visited, only a few months back, there are 8-10 new templates for various topic and styled presentation. They are so useful for their flowcharts, graphics and backgrounds. Most of them include tables and maps but they all have a series of icons and clearly support a one color presentation styled focus. Give Slides Carnival a peek to add some variety to your classroom lesson slides. Communicate creatively! Video on a Chromebook - No Problem! More and more schools are equipping students with Chromebooks as another tool in the toolbox of the 21st Century educator. Making use of the webcam is something that kids love to do but using it requires opening up app and resources that are not always the best for kids under the age of 13. While a resources like WeVideo is great, it has many steps and is not one I would consider to be a simple solution for a teacher that wants to do a simple one-take video. So, I went searching, and I found it! Clipchamp is a web-based service that is great for kids as the videos that you make never leave your computer, there is no needed account to set up and it is free! 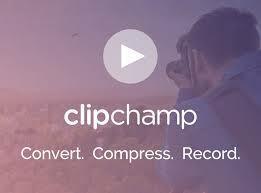 Students can record up to a 5 minute video using ClipChamp. Once the video is recorded they can either download the video to their device or they can share it. Sharing the video give them options to send the video to Vimeo, YouTube, Facebook or.... GOOGLE DRIVE! Yea! How perfect for schools using Chromebooks! ClipChamp is also available as a Google Chrome App in the Chrome Web Store here. Once you are done, the screen will change to a green color and you will notice two buttons for "Share Video" and "Save to Computer"
When you allow ClipChamp to save to the Google Drive, you will be given options as shown when saving. Complete the form and Publish! From Google Drive the video can be shared with only certain people. The integration with Google Drive is key here because it allows students the opportunity to create a simple video and share it with their peers or teacher. Another great tool to help kids show what they know!